This was my birthday cake. Did I mention that I turned 30 last November while Noble and I temporarily lived with my in-laws. I am very lucky to have loving in-laws that were more than happy to have Noble and I stay with them for three weeks before we moved to Georgia. I often talk about the time "Noble and I lived in West Virginia" and I am sure Noble will have to hear stories about it the rest of his life. You would think not much could happen in three weeks, but we had quite the time. Noble experienced his first snow which happened to be a blizzard, we had no power for several days, we celebrated Noble's first Halloween, and I had my 30th birthday. My mother-in-law, who I love dearly and is a fantastic baker, made my favorite cake for my birthday which was this Orange Pound Cake. She made it several years earlier for one occasion or another and I fell in love. I saved this post for this long because I think an Orange Cake fits much better in the summer...and I forgot about it. This cake is absolutely delicious and keeps well for many days. I highly recommend it. Preheat oven to 350 degrees Fahrenheit. Butter and flour a 10-inch tube or bundt pan. Beat butter until creamy. Gradually beat in sugar. Add eggs one at a time. Beat in extract and rind. Combine flour, baking power, and salt in small bowl. Gradually beat into butter mixture on medium speed, alternating with Orange Juice. Beat until smooth. Pour into prepared pan. Bake at 350 for 35 minutes. Lower heat to 300 and bake an additional 45 -50 minutes or until toothpick comes out clean. Cool in pan 15 minutes. Turn out cake and cool completely. 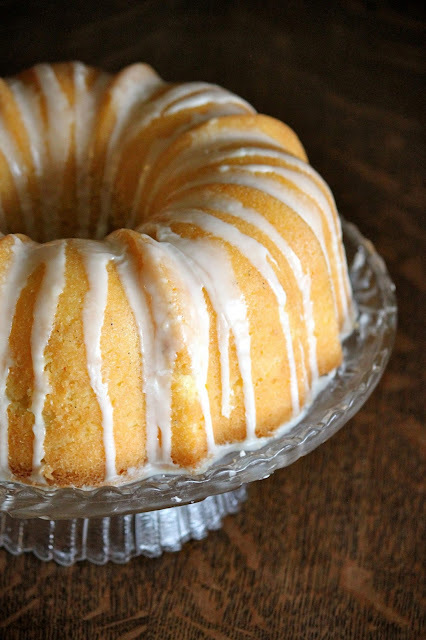 In a bowl, whisk confectioners sugar, juice, and water until smooth Drizzle over cooled cake. Let dry completely before slicing.